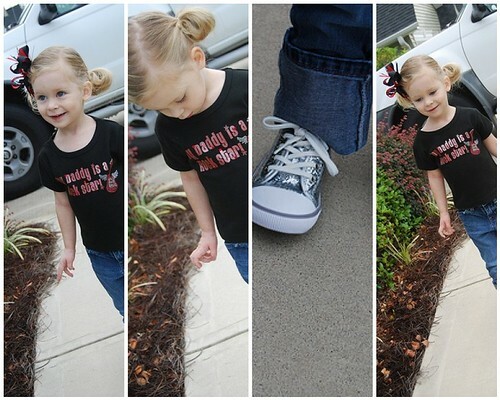 Landree sported her shiny new sliver tennis shoes on the 2nd day of preschool. Mia and Popee ordered her a few new pair for her birthday and these were a surprise. How cute? These may have to go with everything we own. She is supposed to wear tennis shoes to school. Don't they know tennis shoes don't go with everything? So Mia and I have been searching the net for a cute pair that can go with dresses or pants. Crocs has several cute new styles out and so does Striderite. Our favorite shoe sites are endless.com and shoebuy.com they both have free shipping and endless ships overnight-they even have free returns-it beats going to the store! I hope Landree is enjoying Preschool...by the looks of it she is having a ball-and love her preschool fashion! These shoes are ADORABLE.....I love them and I think Sarah would too!! Thanks for the shopping tips.....I usually shop at Zappos, but I am going to check out endless. Hope you and your sweet family have a great weekend!! You dress her PRECIOUS! I love the shoes. How are you feeling? Baby Hudson is adorable. I just want to hold and kiss him!!! Good times!!! Love them! They WILL go with everything too! She looks just edible! I will check out the shoes too! Where do you get her hair accessories? Oh, and I love her tshirt too! She looks ADORABLE!!! so fun! i am going to have to try endless, that sounds great!